The significant bounce-back seen so far in 2019 has been finding it difficult to make further headway in March. Investors are seemingly reducing their exposure to developed equities, particularly in Europe where economies are struggling, especially in manufacturing. European equities managed to gain 1.09% over the month as the news from China, both with regards to the trade deal with the US and government attempts to reflate the economy, became quite optimistic. Indeed, Shanghai Stock Exchange A shares gained a further 4.8% in March on top of February’s 13.9% to be 27.03% better on the year in US dollar terms. The sense of a slowdown has also seen the beginnings of a rotation from growth stocks into defensive, quality stocks where utilities, healthcare, consumer staples and industrials are seeing more investor interest. However, with bond yields still contracting this will remain tentative. The month really was more about the march lower in government bond yields as central banks started to pull back from quantitative tightening. The most significant about-face was performed by Fed Chairman Jay Powell, who – significantly – stated that he would be prepared to run US inflation above trend in light of having had a period in which it has run below trend. The Fed also announced that it would commit to no rate hikes this year and would start tapering its balance sheet run-off policy. 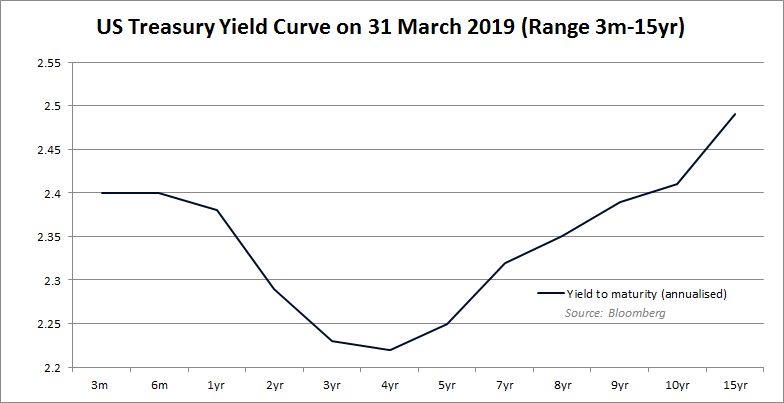 This led to the US Treasury curve inverting, which is believed by many to be an early indication of a forthcoming recession; it is one thing for stocks to rally on an easing in Fed policy but quite another to do so in the face of rising anxiety over weakening technicals. Unless meaningful stimulus materialises in the coming months, the positive performance in equity markets is less likely to last. Most developed market blocs saw government bonds outperform equities with US Treasuries gaining 1.99% vs 1.79% S&P 500; UK Gilts +3.36% vs. +2.30% UK FTSE All Share and Eurozone government bonds +1.80% vs. Eurobloc equities +1.09%. A yield curve inversion basically means that investors are prepared to borrow long term at a lower rate than in the short term, indicating that they expect interest rates and / or inflation to be lower in the future – as would be expected during a period of recession. 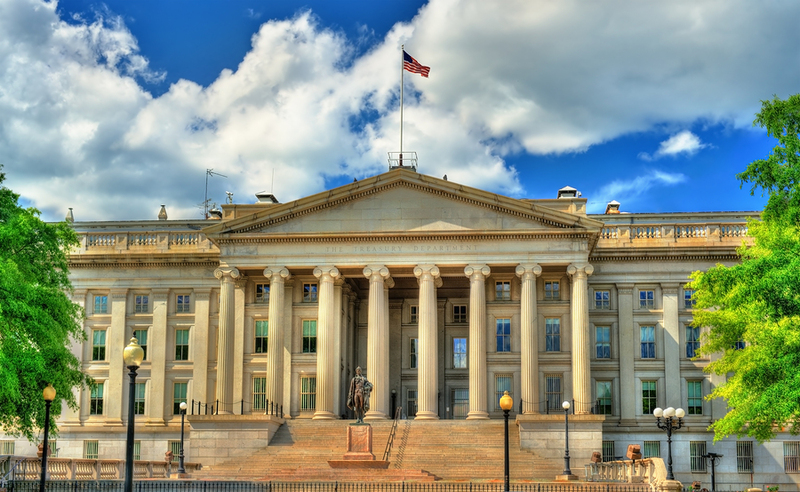 However, it could be argued that the predictive qualities of the government bond yield curve have become blunted by the interference of central bank QE that confuses market-driven investor demand flows. Even so, historically, any recession that the curve can foresee tends to take up to 18 months to 2 years to unfold and, therefore, there is time for central banks and governments to continue to try to manage expectations. Our view is that we are in a late-cycle environment, a phase during which economic growth is still positive but declining and which can last for up to two years. In this phase, bonds tend to outperform stocks, and as the cycle evolves a bias to long duration bonds is preferable. Historically, defensive stocks outperform cyclical with healthcare, utilities and food & beverages typically doing well, and banks & financial services, tech and industrials performing poorly. The question is whether this cycle is different. We have struggled to see that classic rotation into defensives while the Fed’s new cautious stance, coupled with the neutral outlook for the dollar, could arrest the march to recession and create benign conditions for the bull market’s old favourites: stocks in the tech, lifestyle and retail sectors and the emerging market regions. March saw the sharpest decline in global government bond yields since the aftermath of the Brexit referendum in June 2016, and by March 29 we were supposed to have engineered the UK’s exit from the EU. As we all know, we enter April no closer to this day than we were in 2016 and the UK economy remains largely on hold. We have written a couple of pieces on the value inherent in UK equities particularly for foreign investors in the event of a softer Brexit, but presently the outcome is far from predictable with many investors preferring to stay sidelined. 10-year UK Gilt yields finished the month back below 1%, but government bonds will be driven by whatever policies the Bank of England implements in the aftermath of Brexit negotiations. In summary, March ends with equities, corporate bonds and government bonds in positive territory year-to-date thanks to more dovish tones from central banks, positive soundbites from the China–US trade negotiations and stronger China PMIs pointing to a recovering economy. We believe that the state of the Chinese economy, US monetary policy and the outcome of Brexit negotiations remain key to the next chapter of the global economy.